OnePlus recently announced OnePlus 5T and which will start selling tomorrow on 21st November. Buyers are waiting for the chance to get the phone and also get the reviews whether it is worth it or not. 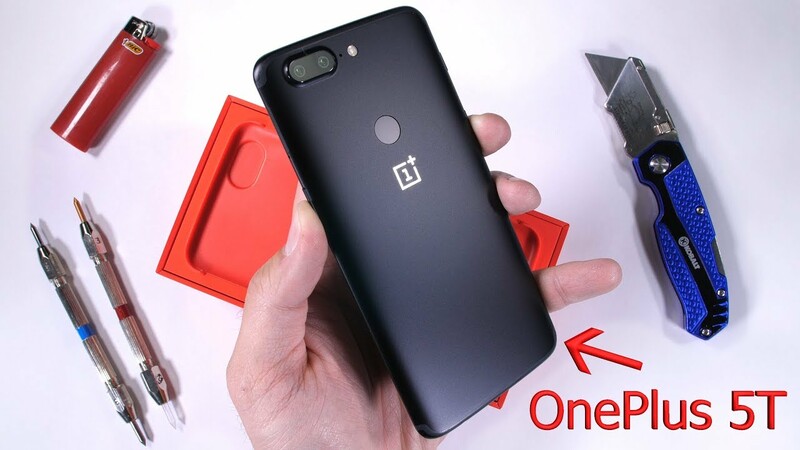 OnePlus is making phones for years and never disappointed in terms of build quality. But can the same be said about the company's latest flagship, the OnePlus 5T? Popular YouTuber JerryRigEverything has decided to find out by subjecting the device to his famous durability test. Starting off with the usual screen scratch test, the OnePlus 5T manages to hold its own. Thanks to Gorilla Glass 5, the phone scratches at a point where any 2017 flagship would. The 16MP front camera is also protected by the same toughened glass that safeguards the display, so coins and keys in your pocket won't be able to do any damage. Meanwhile, the earpiece grille is made of metal, and unlike most nylon coverings, there's little risk of piercing it with a sharp object. Moving on to the other side, the anodized aluminum alloy back plate of the phone can be easily scraped by a razor, but it should be more than tough enough for day to day use. The rear-positioned fingerprint scanner is made of ceramic, meaning that it's virtually immune to scratches. Perhaps the only trial which the OnePlus 5T failed was the burn test – the 6-inch AMOLED screen didn't recover from the burn mark, which was applied with a common lighter. Still, you'd have to subject your phone to 20 seconds of abuse to achieve similar results.